Capturing a fascinating moment with a camera while on a vacation or a trip is truly incredible. This not only creates a lasting memory but also bring great fascination from the events that transpire during such a trip. 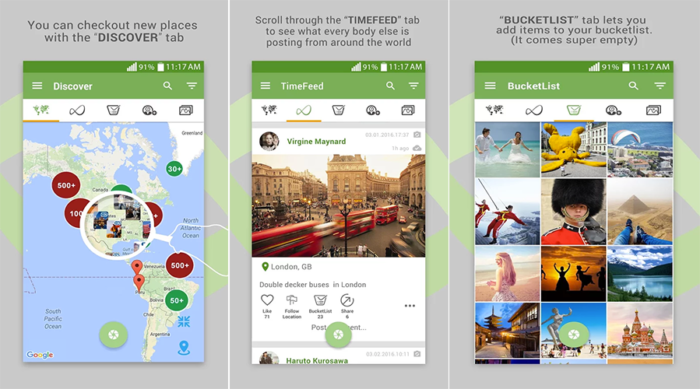 TimeSet app has been designed to make that experience more real and unique in its own way. Its users can now capture different photos in real time (with both place and time details being displayed) and share such photos with friends. Besides, a chance to create an anthology of images is offered by this great app; this is meant to allow different users share their adventure experiences in an amazing bucketlist. Clearly, TimeSet app has truly transformed the face of photography and made exploration to be extraordinarily admirable! After downloading and installing the app, one can proceed to update the profile and proceed to invite friends. This is facilitated by sending requests to friends and other people. The next thing involves creating a bucketlist based on the preferred categories; these may include interests in sports, fashion, nature, technology, food, education, entertainment and much more. Through creating such a bucketlist, this can help establish or join a community with shared interests. To facilitate such a process, the user can share the bucketlist with others. TimeSet app allows one to upload or capture photos that are geo-tagged with ease. Additionally, other users can make comments and likes and even share or follow locations. The entire design of the app is meant to ensure that the users can have a great exploration experience and share their real-time photo capture with friends. Indeed, this is a must-have app for photographers and ardent photo lovers! Currently, the devices that work well with this app include Android devices version 4.1 or up. This is because such devices have exhibited great capabilities in providing exceptional performance for the app. This is an amazing feature that introduces the user to a world of unique exploration presented with highly-updated maps. Once the user has created a bucketlist of interested goals, it is good to discover other people around the world with the same interests. Through checking their bucketlist, it becomes easy to understand the communities to join. Under the timefeed platform, one can be able to see clearly what other individuals are posting. The photos posted are geo-tagged as they tend to indicate the place where it was captured and the exact time. Interestingly, TimeSet app has adopted an amazing platform that supports high quality photos. Such posts can be followed by a brief description of the photo. Meanwhile, other users in the community can like, post comments, share or even follow the location given. TimeSet app offers the user a chance to come up with a unique bucketlist of interested events that one prefers. Some of the outstanding interests may include entertainment, sports, art, foods, natural sceneries, education, buildings, cars and even ancient unknown cities. Users with shared interests on bucketlist can end up creating a community in order to efficiently interact and share adventure ideas. When an individual is new to the TimeSet app, there is a platform where one can send friend request mostly based on contacts or other people using the app. Meanwhile, this great app offers an interactive platform where users can share different adventure ideas. Besides, one can send to the community member an invitation request for a group adventure experience in a localized area. This can offer a chance for individuals to meet and share personally their interests. Such events may include mountain climbing, skiing and even cultural activities. There is nothing better than having an amazing platform to share real-time memories while in different locations. TimeSet app offers such an incredible opportunity where one can post photos from the camera or the gallery that are geo-tagged. Friends and other users can then like, share, comment and follow such locations. This could really be the best photo experience ever especially if one is in a trip or vacation. TimeSet app presents a true definition of a high-quality photo capturing app that applies geo-location feature. This is to ensure that its users get real-time photo experience and easily share them with friends and people in their community. The entire design and formation of this app is intuitive to ensure that user’s overall satisfaction is achieved. With the current overall rating of 4.7 stars, this truly implies how worth it is to download this app. Get this app today for free from Google Play and get commence a great adventure! This app offers an interactive platform where users can share different adventure ideas.